Even though we speak Swedish at home with the kids, we try to read English books and introduce the kids to some of the more "common" American Childrens' books. Even though they know their Alfons and Viggo and Emil, their childhood isn't just "Swedish" and they need to have other references too. I like this - I'm a book lover and I like exploring American childrens' books. 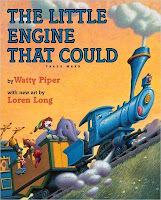 Right now the Son's favorite is "The Little Engine that Could" (which I think is translated to Swedish too). I got the book through the Scholastic bookstore through the Daughter's former preschool - a great way to support the school (the Kindergarten has the same program) and get books at resonable prices. The version we have is not the original one, but a newer edition, illustrated by Loren Long. I love her pictures just as much as the kids do. On her webiste you can see sketches for the book compared to the finalized drawings. And for days now we've walked around the house saying "I think I can, I think I can, I think I can"! I'd like to do the same with Swedish books for my daughter but the only ones I remember from my childhood are Astrid Lindgren and Lagerlöf's Nils. Can you recommend titles/authors for older children/teens, especially those considered to be classics? I'd like to read them, too. If you'd like more recommendations of American authors/books I love for myself and my kids, we're big book people as well. We have the ones at home plus a hefty amount of English-only at my parents. Plus we're regulars at the library. I'm actually saddened by how commercialized Scholastic is now compared to when I was little. It used to be that all the books were beautiful Caldecott winners but these days Scholastic gets kickbacks from Disney and Nickelodeon so it's just book form of the same stuff on TV. Of course there are still great books on there but you have to sift through the franchise stuff. How wonderful that you are exposing your kids to the best of both cultures. I'm American, my wife was born in California of Swedish immigrants. We are trying to do the same. This story is, I think, a quintessential American tale of perseverance, self-reliance, positive-thinking, and optimism. I was raised on it, and I do hope that many more generations of Americans, born or immigrant, learn its simple but powerful lessons. Thanks for your blog -- we really enjoy it! Christina - I think I'll blog about this - I like to do a list (and hint hint get family members to bring the ones we're missing). Ally - we've already talked about this - and I'd love to get a list of the American classics! Tom - I LOVE this book - it sure is powerful and so elegant. I've read it every night for a couple of weeks now - and the son is still totally hooked. Thanks for liking the blog! That would be a wonderful post, a list of Swedish classics. My cousin and his family are planning to come for a visit this summer so perhaps I'll make some requests! Some American books that we liked a lot when my daughter was little were Miss Rumphius, Roxaboxen and Somebody Loves You, Mr. Hatch. There is a catalog (and now, website) of children's books called Chinaberry where we discovered all these books -- and many more. It's a great resource!